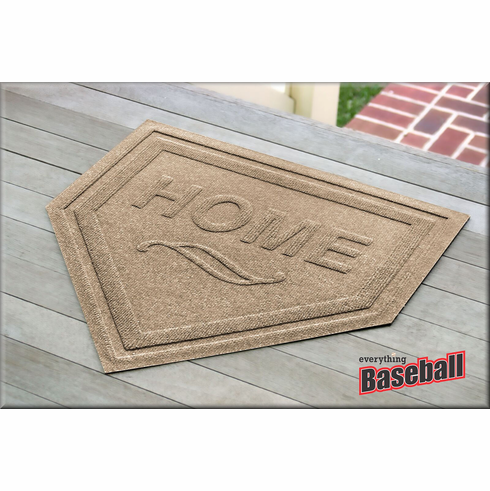 Baseball Home Plate Aqua Shield commercial grade door mats, offered in 19 colors, are a great solution to trap dirt & moisture. Premium-grade, 24oz, anti-static polypropylene fiber face won�t mildew, mold, or rot and is resistant to the most extreme elements, including sunlight. Molded design will not crush or break down over time or use. Exclusive �Water Dam� rubber border keeps dirt & water in the mat and off the floor! Non-skid, SBR rubber backing is green friendly with 25% recycled rubber. Hose clean as needed. Remove stubborn stains with a mild detergent & scrub brush. Measures appx. 23" x 22 5/8".